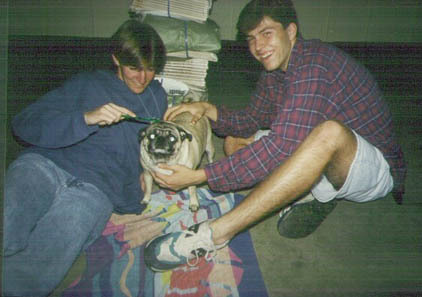 Background: During their Junior Year, Incredible Guy and the Animal were enrolled in Mr. Bonnard's Honors Physics class. Mr. Bonnard, best known for being the sponsor of the Bill Nye the Science Guy Club, offered extra credit to students who produced a video about physics. Since Paul had paid little attention in the class and done his homework intermittently, he really needed the help. So he and the Animal teamed up to produce... The Physics Video. Mission Objectives: Produce a video that contains as many MAD FIGS references as possible while still appearing to have educational value. Planning: The video was filmed over the course of a few days. In all the scenes, the actors had a basic idea of what they wanted to do, but the script was mostly ad-libbed. Execution: This section will consist a list of the memorable scenes in the video. The movie opened showing "The Ferociously Funny Fig Filled Fysics Film" written on the outside of Mr. Bonnard's classroom, with Paul reading along as the camera showed each word. This was followed by a panoramic view of the other MAD FIGS standing around and making funny noises. The next scene was filmed at the site of the Fascist Varmitzfa (sidewalk outside of the walker building at BHS). The MAD FIGS were standing in formation, and the Flash exclaimed "Starring..." Then, they began a harmony with the words "MAD FIGS", going from lowest (Scott Dogg) to highest (The Animal). The film began with a monologue from Paul about "enertia". The original video included the Animal asking, "Is that how you spell inertia?" at the end, but this was inadvertently edited out of the final cut. Mr. Bonnard did not notice. Also included to demonstrate inertia was a scene filmed at The Dam Diner. This was basically a panoramic view of the restaurant followed by Paul sliding a salt shaker across the table. Next, a scene on the pool table was included. It was supposed to demonstrate angular velocity or something like that, but Paul and the Animal had lost their notes and therefore had to make everything up. First, Einshtein was introduced. He presented his equation "E = mc squared" as the solution to the problem. When asked how this explained anything, he looked frightened, then asked "What's that?" and mysteriously disappeared when the camera looked away. Another key scene involved calculating how fast someone would have to run to jump into a pool from the roof of the Steinke house. This may have been the first public appearance of The Great vinnardo. With "Making Plans/Gathering the Clans" (track 8 on the Braveheart CD) playing in the background, he leaped just as the music peaked (about 58 seconds into the song). He landed safely in the pool, but was seen floating facedown for several seconds as Winston (Paul's dog) ran around the pool in the background. Paul commented "I think he's okay..." before the scene came to a close. Next came a scene about velocity or something. It involved Jacob kicking a soccer ball and trying to hit a cone. Unfortunately, Einshtein walked in front of the cone, and was knocked unconscious by the blow to the head. To demonstrate centripetal force, the Animal swung Scott Dogg around with a rope tied to his neck. First, the Animal could be seen holding the rope and turning around. Then, Scott Dogg could be seen swinging around wildly (and with careful observation, the Animal can be seen in the background). Next was a section on inclined planes. Kisses the dog pulled a book up a ramp into Scott Dogg's van (with the sign "MAD FIGS Labs" hanging on it). While the Animal was explaining inclined planes, Einshtein popped up from the back seat and proclaimed "Some mats are longer than others!" The most dangerous scene in the video was shot at Bullard High School with one of the deadliest enemies of the MAD FIGS... The Machine. For the scene, Einshtein was launched at least 7 feet straight up in the air. Luckily, with so many MAD FIGS there, no casualties ensued. The video closed with a nearly unexplainable scene. Vinnardo, the Animal, Scott Dogg, and the Flash were scene standing with Mark Ekins, who held a cigarette lighter. The Flash exclaimed "Mark, what are you doing?!?" and Mark proceeded to hurl the lighter to the ground. It exploded with a bang (barely audible on the video) which sent the MAD FIGS fleeing into the distance. As they ran off, the Incredible Guy could be heard to observe, "And there go the MAD FIGS... my God." A perfect summary of the film. Follow-up: The film was submitted to Mr. Bonnard for approval, despite its obvious errors and lack of actual physics information. But Mr. Bonnard loved it, and showered its creators with extra credit points. Unfortunately, he loved it so much that he took it with him to southern California when he moved. All that remains of the film is the uncut footage, supposedly in the possession of the Incredible Guy.